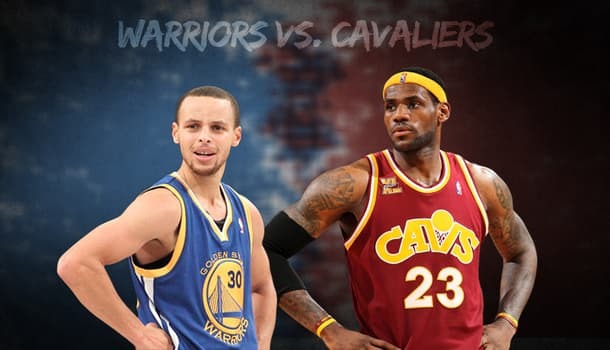 I’m sure many predicted the Cleveland Cavaliers and Golden State Warriors would be battling it out in this year’s NBA Finals. This series is going to be insane and I can’t imagine the series lasting less than six games. The Cavaliers are 12-2 in the NBA playoffs – the two losses came against the Bulls in the second round. They swept the Hawks in four games in the East Finals. However, the Cavs knew the real test wouldn’t come until the finals. Golden State put up a 12-3 record in the NBA playoffs thus far against some tough opponents in the West. Both teams have had a relatively easy run up to this point, but that should all change. Let’s take a look at the series odds and then I’ll get into my predictions for how I see this series playing out. You can actually bet the Cavaliers to win the series at GTBets and the Warriors to win the series at Bovada, and get a 1.73% ROI arb. However, we know you’re not looking to make a small profit on an arb, so let’s preview the series. Who is the most complete team? I believe it’s safe to say the Warriors are the most complete team in the NBA. The Cavs could make a good case if they had Kevin Love and Kyrie Irving both at 100%, but that’s not the case and the loss of top-tier talent will hurt them. I figured the Hawks would put up a much better fight than they did, but after losing the first two games at home, they were never able to recover. I can’t imagine Lebron James dominating the Warriors like he did to the Hawks. Golden State had a scare when Klay Thompson went down due to a knee to the head. Thompson was initially ruled fine, but it turns out he has a concussion. However, he has almost a week to recoup before the series start. J.R. Smith was a big part of the Cavs success against the Hawks, but Thompson is the best defender at SG and he isn’t going to be beat by Smith. James was likely crush Harrison Barnes one-on-one, but look for the Warriors to send help. When James makes his move for the paint, Draymond Green and Andrew Bogut will clog the lanes. Look for Andre Iguodala to play some important minutes to help cover James in the series. He did good on Harden in the last series. He looked fresh due to not playing many minutes this season and he’s capable of frustrating James. BetOnline has released an exact series prop that interests me as well. I believe the Warriors will win the series, so I’m taking a shot on the Warriors to win in six (+450) and in seven (+350), as I expect the Cavs to make this a good series. If the Warriors win in six or seven, this prop will make 2.5 – 3.5 units. Alternatively, you could bet on the total games played prop at BetOnline. The odds on the series going six is +210 and the odds on the series going seven is +190. The potential ROI is smaller, but either team can win the series. These are two great teams and neither team will be dominated. James simply won’t let that happen to the Cavs and he has been getting some help from veteran role players like Smith. This has the potential to be one of the best NBA Finals in recent memory, although it could have been so much better if Love was able to suit up at PF, although Tristan Thompson has been playing great as a replacement.